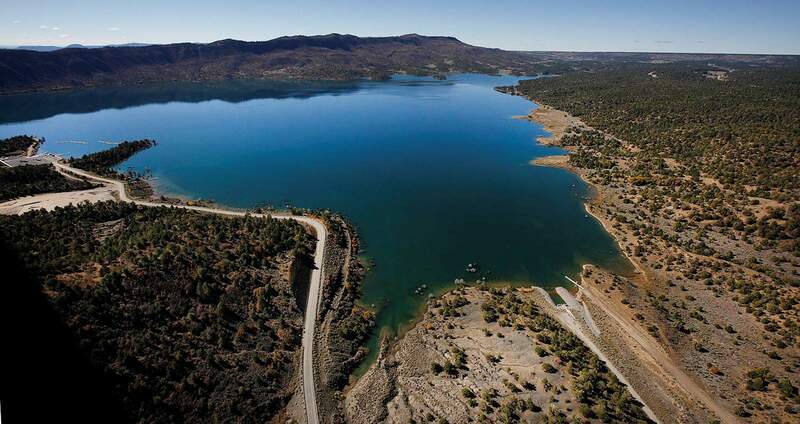 Lake Nighthorse, southwest of Durango, will close for winter Nov. 14. Lake Nighthorse will close for the season Nov. 14 and reopen sometime in April. Durango Parks and Recreation Director Cathy Metz said visits to the lake and revenue projections are below expectations, but full numbers for the season will be not be compiled until after the lake closes. The 416 Fire, which closed the lake for nine days in June, and a two-week period when the boat ramp was reconstructed, hurt visitor numbers for the lake’s first year open to recreation, Metz said. “In the month of June, there were days when the smoke was so heavy people were not recreating,” she said. Lake Nighthorse is required by its environmental impact statement to close during the winter to protect wildlife habitat. For the next three Fridays, Colorado Parks and Wildlife will give away kokanee salmon at Lake Nighthorse beginning at 3 p.m. The giveaways will be Nov. 2, Nov. 9 and Nov. 16. Metz said the lake will open specially for the kokanee salmon giveaway Nov. 16, which occurs after the lake’s seasonal closure. Metz said the $8 vehicle fee for the lake will be waived for people going specifically to the salmon giveaway. Salmon giveaways will be at the boat ramp at Nighthorse Reservoir, 1795 County Road 210, and anyone who wants salmon must present a valid 2018 Colorado fishing license. People should bring a cooler or other container – most kokanee are 10 to 13 inches long. The number of fish given to each person will depend on the supply and demand for the salmon. Parks and Wildlife spokesman Joe Lewandowski said snagging salmon may be tempting, but it is illegal. He also said anglers should remain 50 yards away from the spawning platform. Demand for salmon is expected to be heavy, and Lewandowski suggested people arrive early. Did you visit Lake Nighthorse this year, the first year it was open for recreational use?